The high speed Internet, the high technology gadgets like smart-phones, and the advent of social media made the communication easy and fast. Voice calling, video calling, text messaging, and instant messaging become easy, fast, and convenient. Even after these advancements in communication tools, email is still the most preferred mode of communication in today’s professional realm. Email is the most preferred form of communication in today’s workplace. Throughout the day professionals spend their most of the time in composing and answering emails. But, many professionals don’t understand the importance of email communication. They reply to the mails late or never, or unprofessionally. Today we are going to share important tips to perfect your email etiquette. 1. Use a Professional email Address – If you work with a company, you should use your company email address for business communications. If you are self employed or have to use personal email address for business communications, you should be careful when choosing that email address. Your email address should be professional. A professional email address conveys your name so that the recipient knows who’s sending the email. 2. Perfect Subject Line – Often your subject line determine whether your mail will get opened or not. So, try to engineer the perfect subject line by keeping it simple, concise, and to the point. 3. Greetings and Send-offs – While composing email, always start with a sound introduction or with the recipient’s name. Never start email directly with the contents, let the recipient know whom you intend to talking with. Always finish your mail by saying ‘Thanks’ or ‘Cheers’. 4. Use Grammar and Spelling Checks – You should behave professionally in business communications. This means no abbreviations, acronyms, grammatical or spelling mistakes. Grammar and spelling should be two considerations while emailing in professional environment. Most email clients have grammar and spelling checks, so use them. 5. Get to the Point Quickly – Content of your mail shouldn’t be like sea of words where your pertinent points get buried into it. Keep the content of your email concise, and in proper paragraphs to separate your thoughts. 6. Consider the Privacy of Others – If you have to send emails to multiple recipients who may not know each other, use ‘BCC’ i.e. Blind Carbon Copy section, to prevent others from viewing recipient addresses. Like this you can protect the privacy of others. 7. Use Professional Fonts – Use of fancy fonts in emails looks really unprofessional. Some email clients cannot present such fonts. You should always use professional fonts like - Times New Roman, Georgia, Veranda, Arial, or Calibri. 8. Respond to Your Mails Timely – In business time is called money. Never let your recipients wait long for your replies. Waiting on an email can slow down your operations and hold up your business progress. To get fast access to your emails, you should connect your business email to your phone. 9. Consider Time Zone Differences – If you have to request a call through email from a person living in a country of different time zone, you must ensure that time zone differences have been worked out. 10. Don’t Overuse ‘Reply to all’ – ‘Reply to all’ option is used to send your message to everyone the original message was sent to. Nothing is more embarrassing than sending a mass email that was intended for only one recipient. Refrain from using ‘Reply all’ option unless you really think everyone on the list need to receive the mail. 11. Use email Signature – An email signature is automatically added to the bottom of a message, where you can add a small biography and contact information. It allows a new acquaintance to learn more about you. 12. Ask for Large Attachments – You should ask for sending large attachments. Sending unannounced large attachments eats up recipients’ storage allowance, this may clog their inbox and cause other important emails to bounce. Email is still the most preferred mode of communication in today’s professional realm. By following the above twelve tips you'll develop proper email etiquette that will be useful in your professional life. 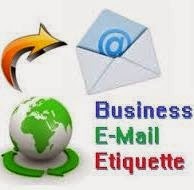 Business Email Etiquette Email Etiquette Email Etiquette for Professionals. Labels: Business Email Etiquette Email Etiquette Email Etiquette for Professionals.